This month we’ll be taking a close look at the up-and-coming star of the future personal transport arena: the electric bike. Regular riders will know that my co-leader, Casey Nickles, and I are passionate about using ebikes for our day-to-day travel needs, and we’re excited to share how they save money, reduce environmental impact and add immense fun! Our first stop will be Orbit City Electric Bikes, where owner Tom Bennett will introduce us to his extensive range and explain how ebikes can be used to revolutionize trips currently done by car or regular bike. Next on our route, we’re going to learn how the power for our ebikes can be made even more sustainable. Kevin Eigel of Ecohouse Solar will be showing us a solar-paneled house in Grandview near Northwest Boulevard and 5th, outlining how solar works, and sharing his thoughts for the future of the industry. Finally, we’ll head back to Lucky’s, where ride members will be able to try out several different styles of ebikes while we socialize post-ride. Returning members and new riders, welcome to the future! Join us by registering below—there is no charge for members or first timers—bring a helmet, and let May 12th be the first day of YOUR personal transport revolution! You're the bee's knees, the shiznit, the best of the best, without you we wouldn't exist! Save the date and roll by to 600 Goodale in the Community Room, conveniently located between the Harrison West Trail and the Olentangy Trail. Find out what we have been up to and what we have planned for the year, plus eat, drink and be merry! 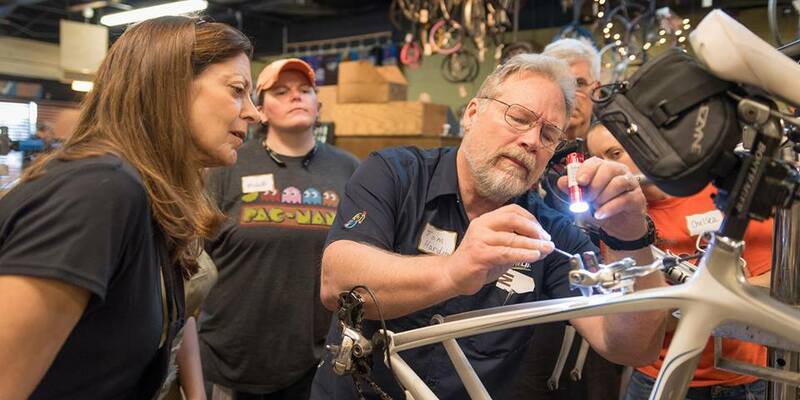 Our partners at Franklinton Cycle Works offers bike maintenance courses, collectively known as FCW Bike School, for adults and teens 16 and older. Classes utilize the Park Tool Big Blue Book of Bicycle Repair and are led by a United Bicycle Institute-trained mechanic. This is the fourth of a 4-class series that also includes “Tires, Tubes & How to Fix a Flat”, “Drive Train Maintenance & Derailleur Adjustment” and “Wheel Truing & Hub Overhaul”. Check the FCW calendar for more about these classes and when they are offered. Yay Bikes! members receive 15% off all classes with the code YAYBIKES. This is the third of a 4-class series that also includes “Tires, Tubes & How to Fix a Flat”, “Drive Train Maintenance & Derailleur Adjustment” and “Brake Maintenance & Adjustment”. Check the FCW calendar for more about these classes and when they are offered. This is the second of a 4-class series that also includes "Tires, Tubes & How to Fix a Flat", "Brake Maintenance & Adjustment" and "Wheel Truing & Hub Overhaul". Check the FCW calendar for more about these classes and when they are offered. This is the first of a 4-class series that also includes “Drive Train Maintenance & Derailleur Adjustment", "Brake Maintenance & Adjustment" and "Wheel Truing & Hub Overhaul". Check the FCW calendar for more about these classes and when they are offered. This is the fourth of a 4-class series that also includes “Tires, Tubes & How to Fix a Flat”, “Drive Train Maintenance & Derailleur Adjustment” and “Brake Maintenance & Adjustment”. Check the FCW calendar for more about these classes and when they are offered. This is the third of a 4-class series that also includes “Tires, Tubes & How to Fix a Flat”, “Drive Train Maintenance & Derailleur Adjustment” and “Wheel Truing & Hub Overhaul”. Check the FCW calendar for more about these classes and when they are offered. Our partners at Franklinton Cycle Works offers bike maintenance courses, collectively known as FCW Bike School, for adults and teens 16 and older. Classes utilize the Park Tool Big Blue Book of Bicycle Repair and are led by United Bicycle Institute-trained mechanic Jonathan Youngman. Sideswipe Brewing will host us as we honor the role of members in our successes of the past year, and reveal how members can plug into our work going forward. Friends, food & first drinks on us! Not yet a member, or expired? Join or renew today!